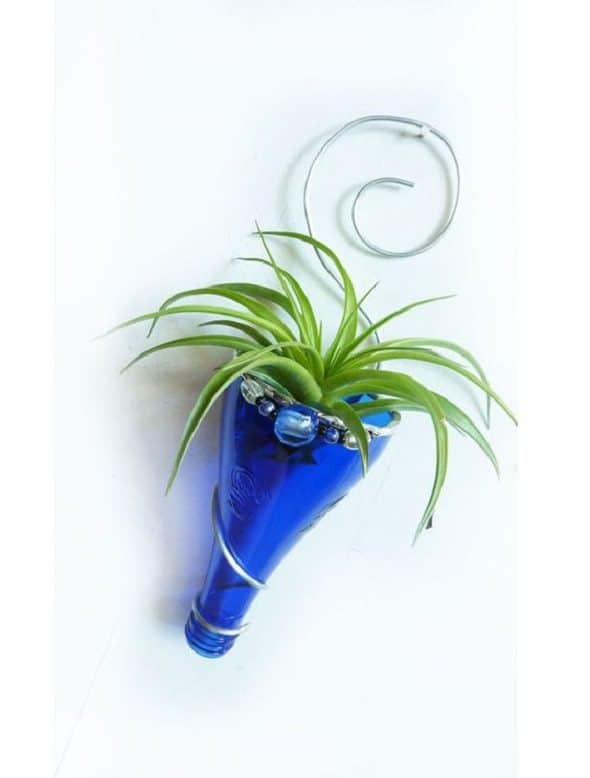 Your imagination can go wild and eccentric when it comes to air plant display ideas; these plants are highly versatile and easy to keep! 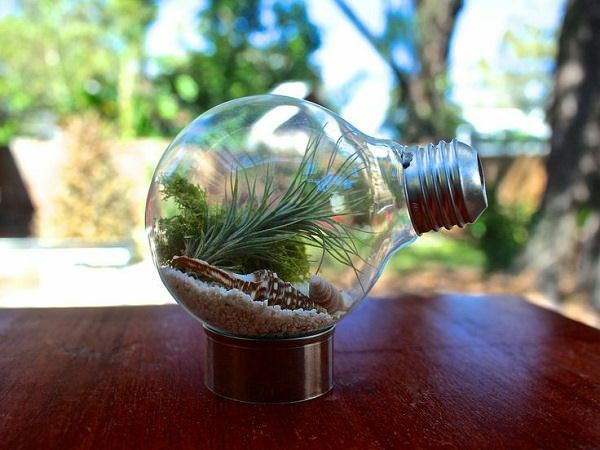 Consider using an old bulb as a plantar and support it with a suitable base. Watch this quick video to see the How-to! Attach the magnet to the wine cork using glue and allow to dry completely. 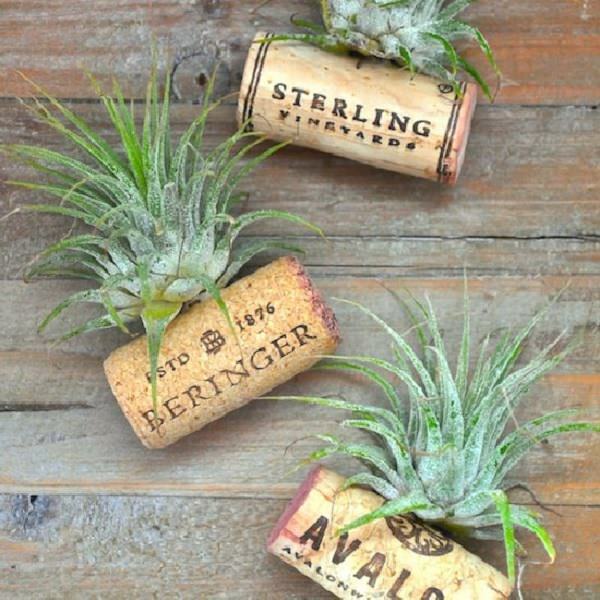 Using a tiny bit of glue, attach the air plant to the cork. That’s it! You may want to spritz it with water once a week to keep it happy. 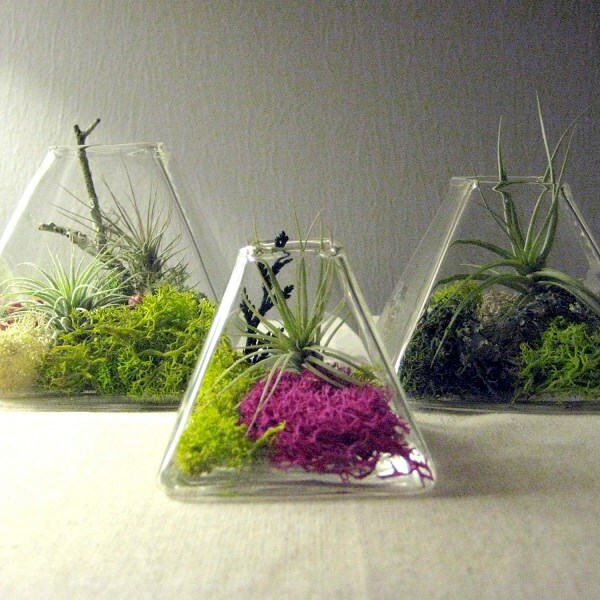 Glass terrariums for table tops can be topped with seashells and mosses alongside the air plants. 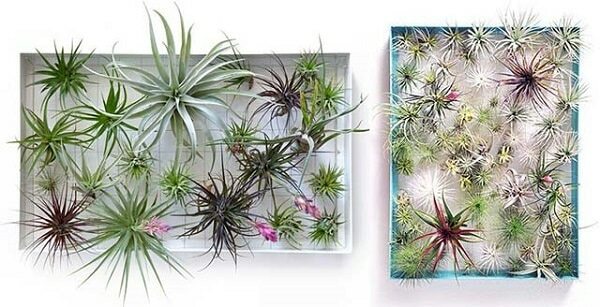 Another appealing air plant display idea to try. You can place it on tabletops or strategical place in your rooms. 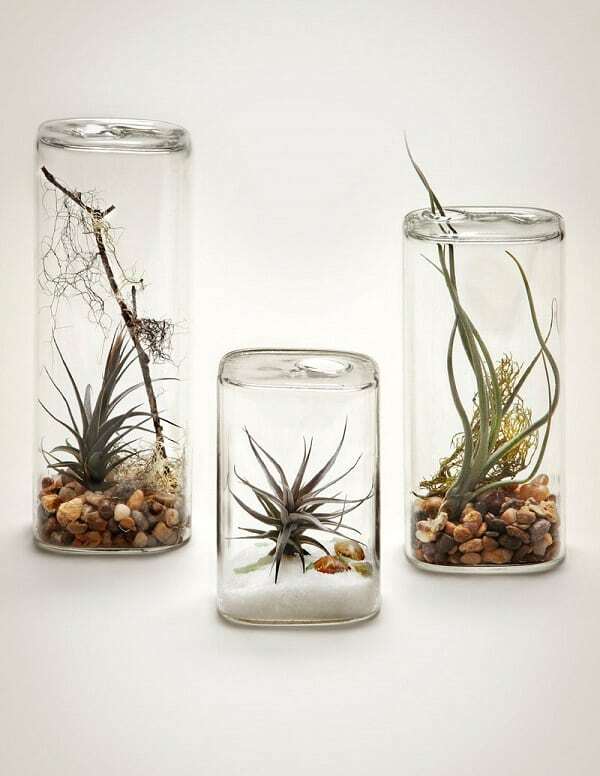 A clear glass bottle can be employed as a planter to show the air plants. 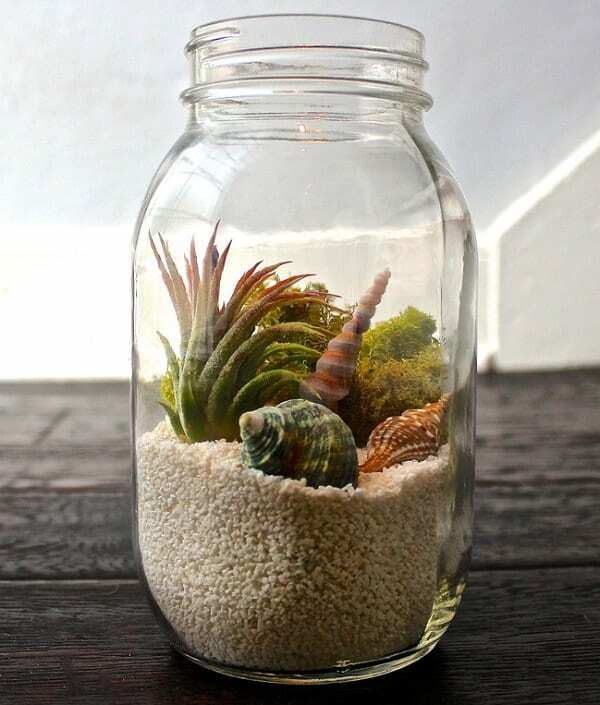 Embellish it with sea shells and conches and other items to make it look interesting! With a cork based coaster and a few other supplies, you can create an impressive display. The DIY is here! 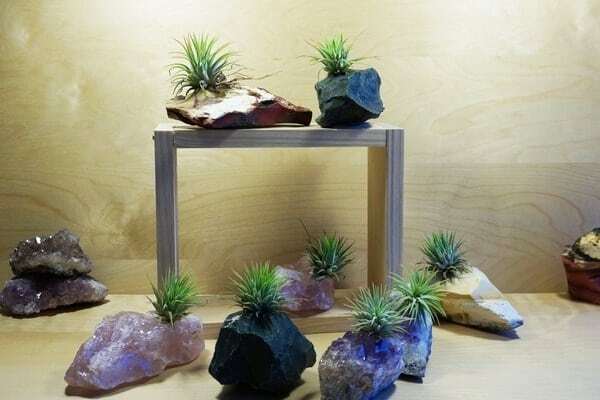 Get a frame and install wires on it to hang air plants. An incredible way to house them. Old picture frames can be used too. 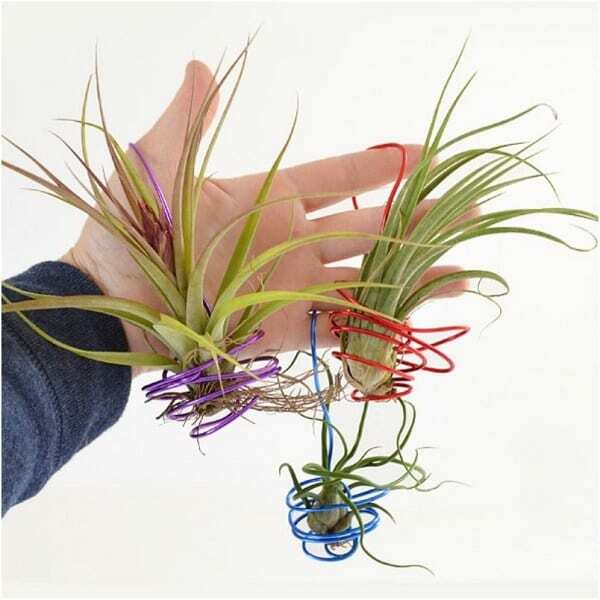 Tying thin wire from side to side, secure the air plants and hang them on the wall. 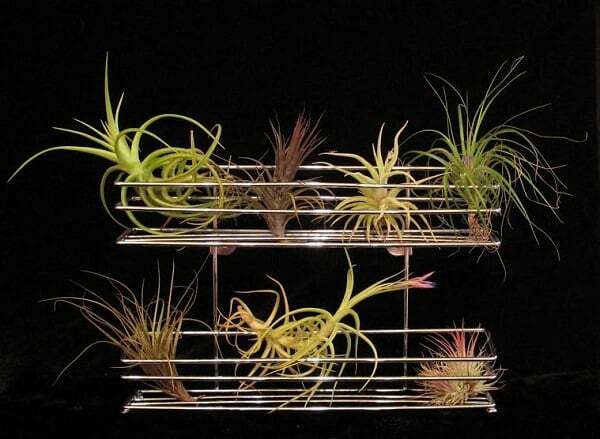 Use an attractive metal caging to hang your favorite air plants. 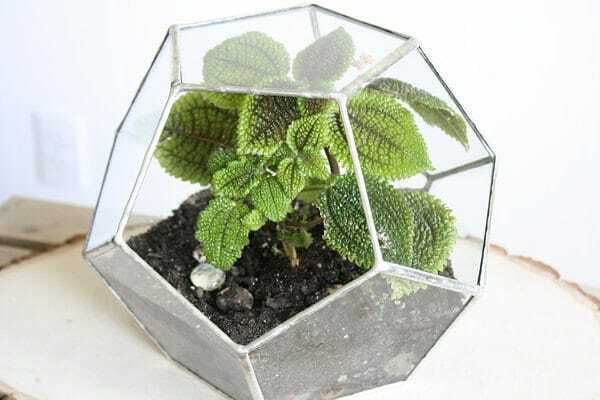 Use thick metal wires for this. 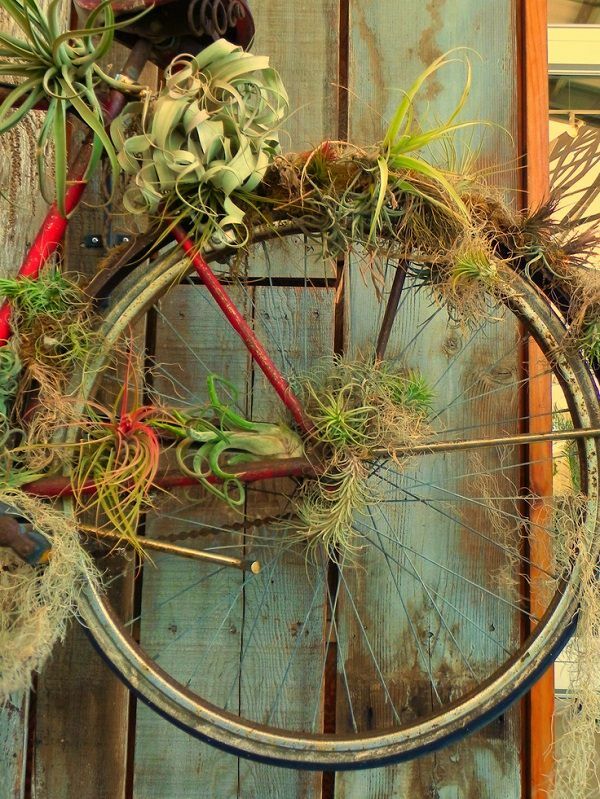 For a rugged look, get an old bicycle and strategically place the air plants for an exciting piece of art and rustic appeal. 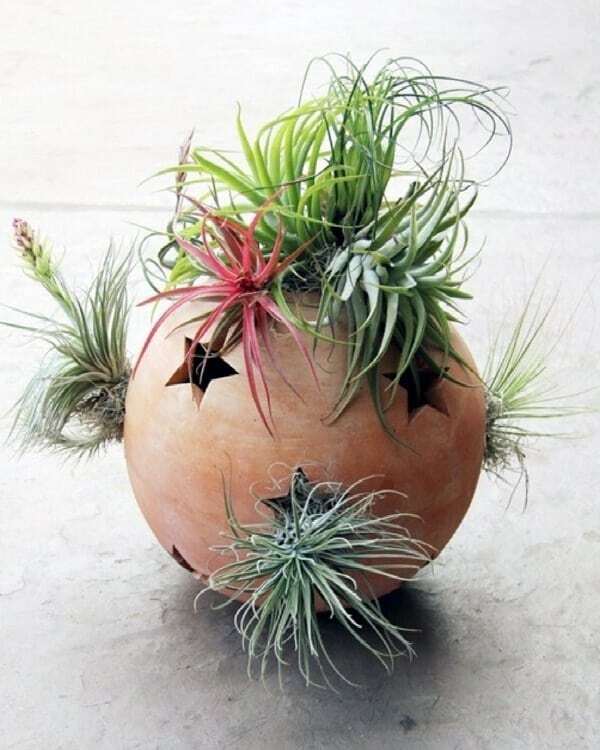 A pot with holes or cut-outs in any shape can make the difference when you want to make your air plants stand out. 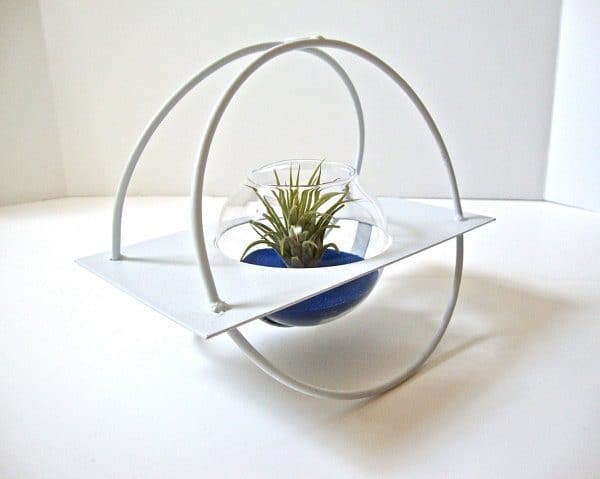 An exotic spiral table holder like this one is edgy and beautiful. 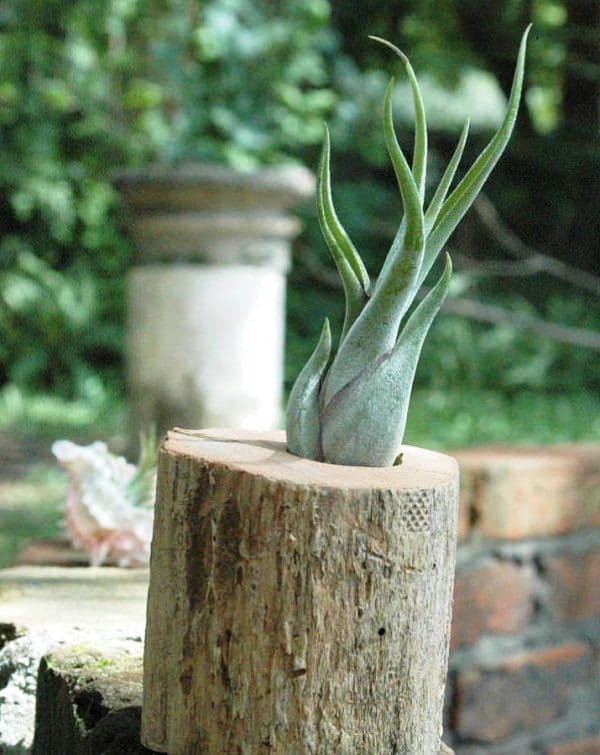 A tree (cedar) stump can be used to showcase the air plant majestically for a unique feel. A nice sizable seashell can make the difference. Look for exciting shapes to make them interesting. Coco pod and bark chips can make an alluring showcase and provide a thoughtful look. 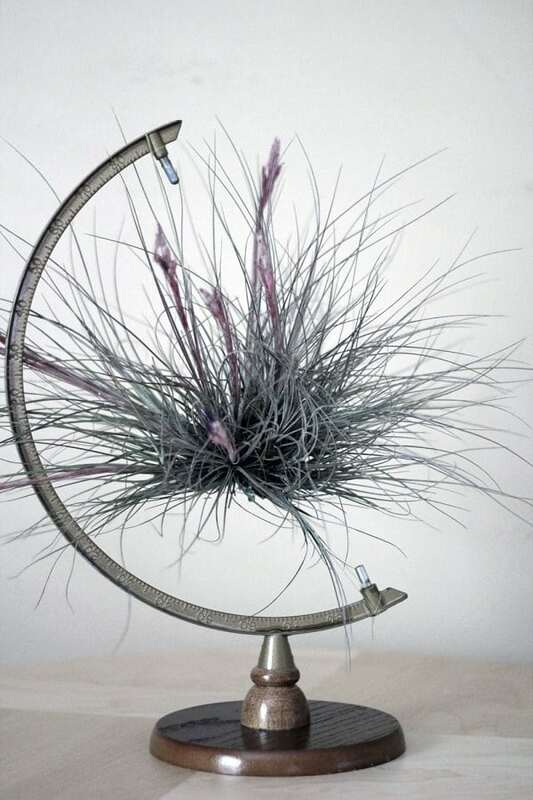 Consider a 3-D linear metallic piece to arrange air plants for a quirky feel. Consider a beautiful suspension idea with an adorable hanging chain as shown. 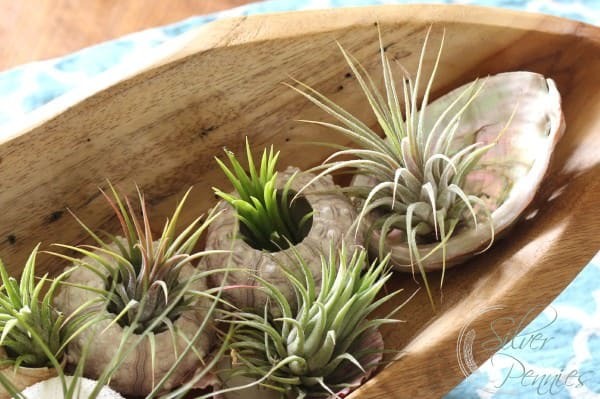 Use several pieces of your earthenwares to create an air plant display masterpiece. 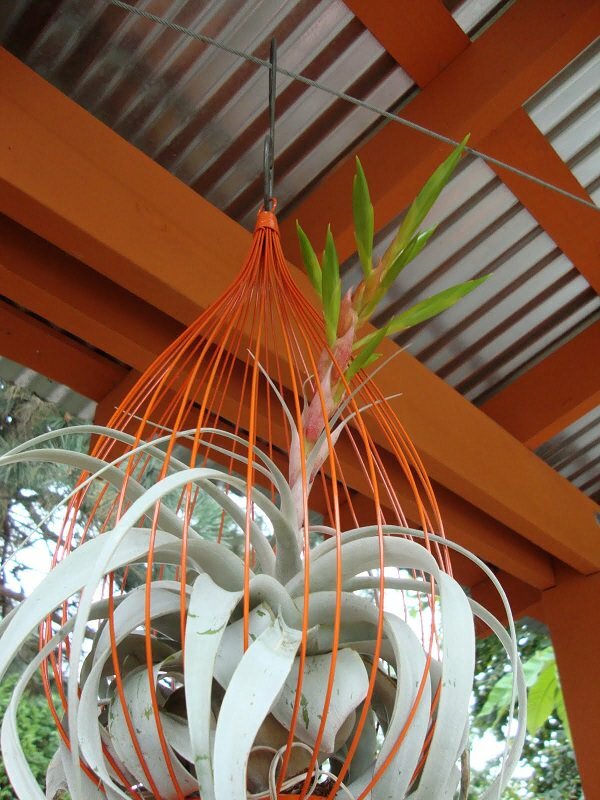 One of the most unusual air plant display ideas to try! 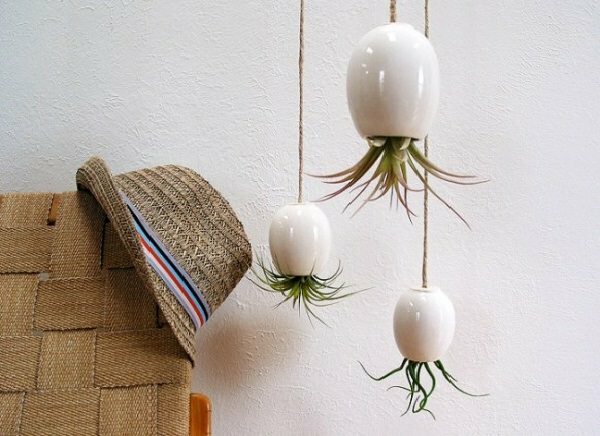 Hanging pots can be used to grow house air plants and you can play around with the colors to suit your existing decor. 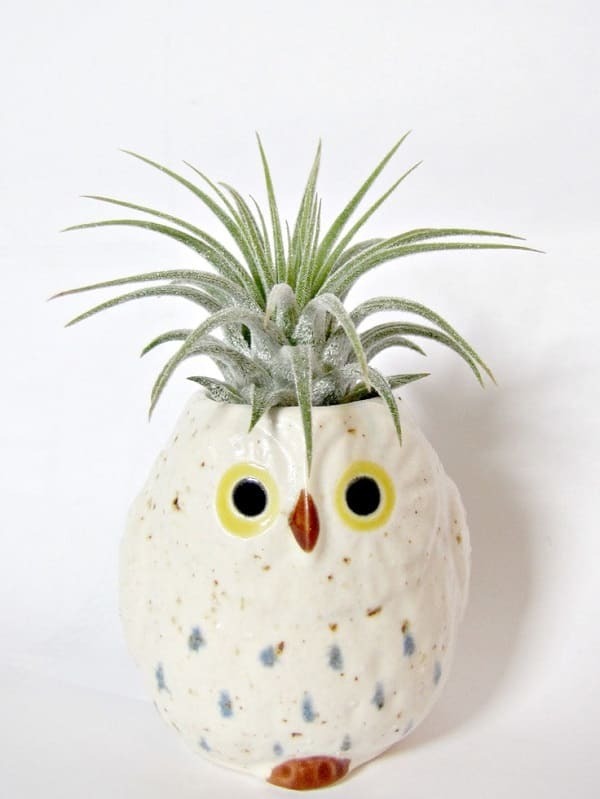 A funny owl piece or similar to it in your home can add a light touch to your decor. 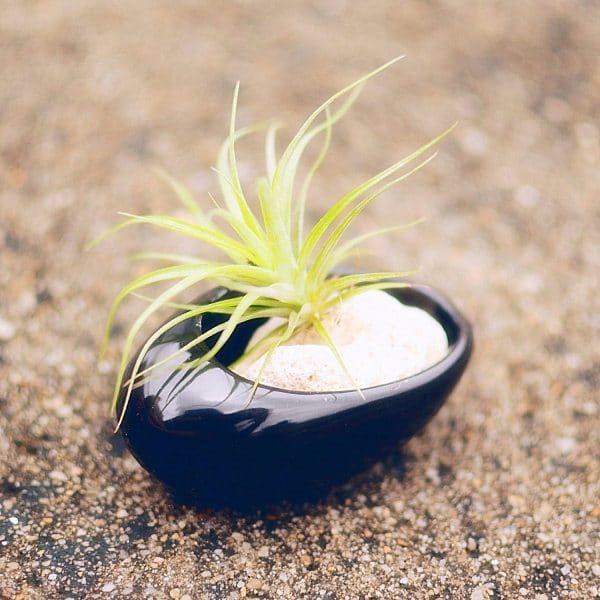 Stones (Crystal stones are a good choice) and rocks make an exciting planter and using them to create an air plant retreat can spruce up the overall decor. Isn’t it cool? The step by step DIY tutorial is here! 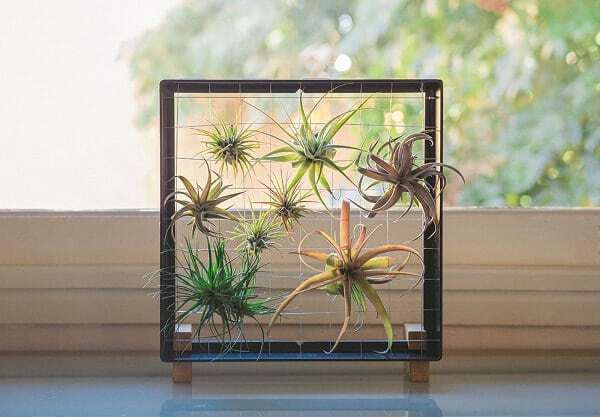 Geometric open stained glass are a good object to place your air plants, they also allow proper ventilation. 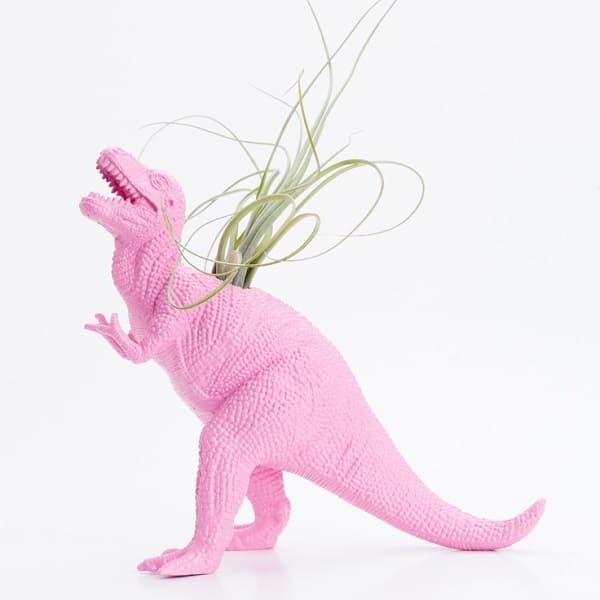 A dinosaur themed planter for air plants is not just playful but exotic to look at as well. Similarly, if you’ve toys with pockets, use them. 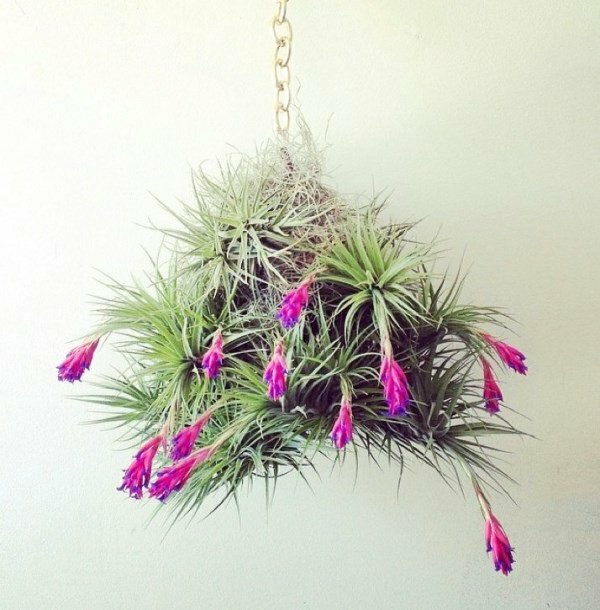 Take hanging air plants to another level by employing a colorful hanger like this. We found the idea here! 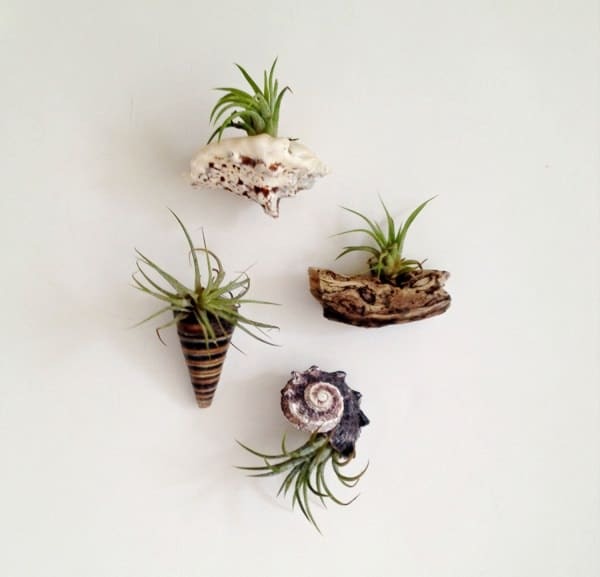 Air plant terrariums can be fixed on the walls too. 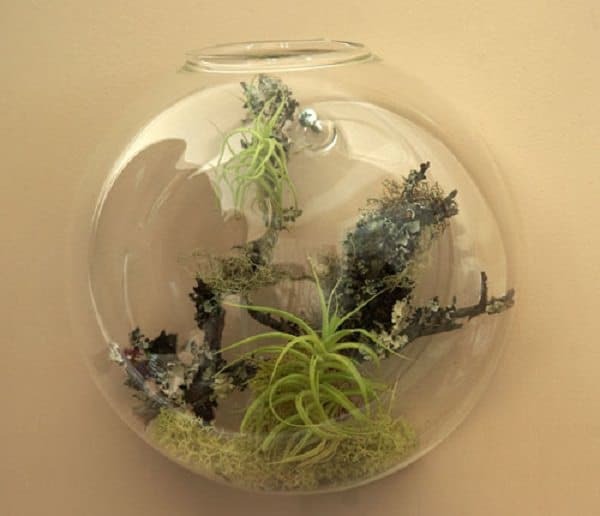 Try wall mounted terrariums to beautify boring walls! 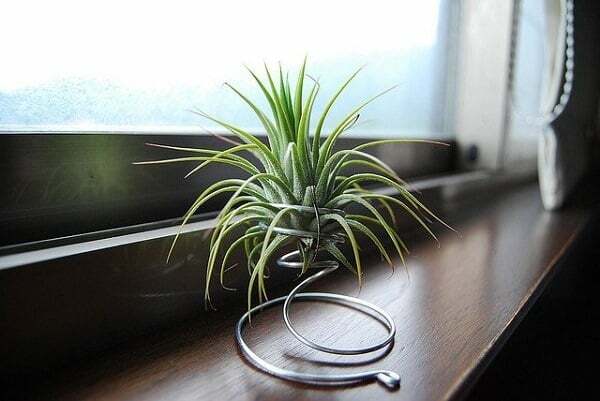 Use branches to place air plants. 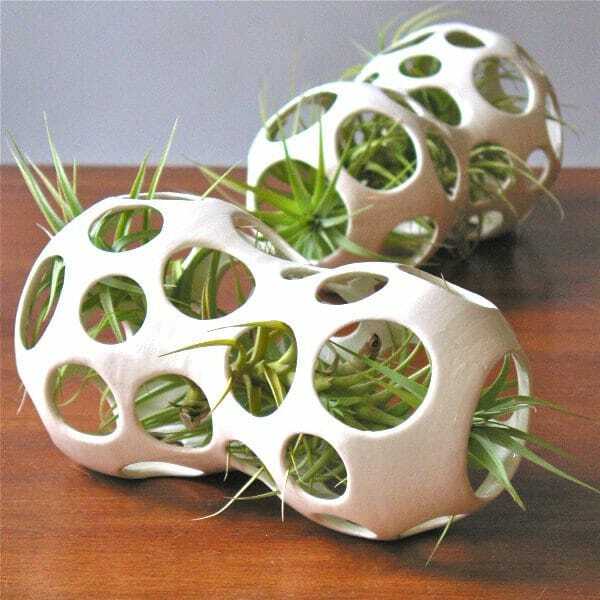 An unusual air plant display idea! 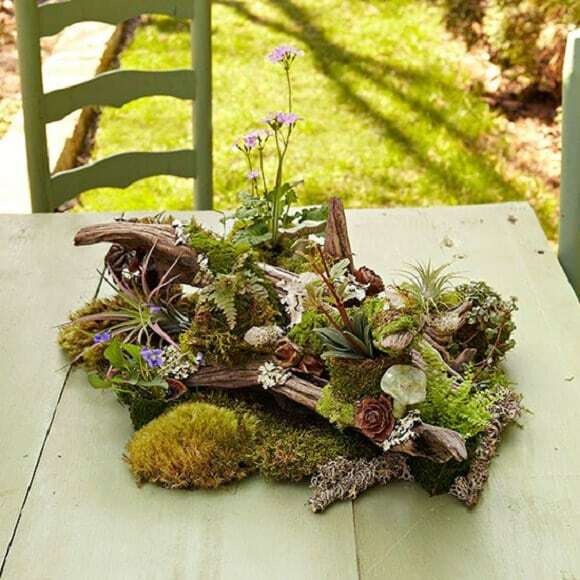 A clear vase and dried moss can create something visually appealing and provides a classic appearance. 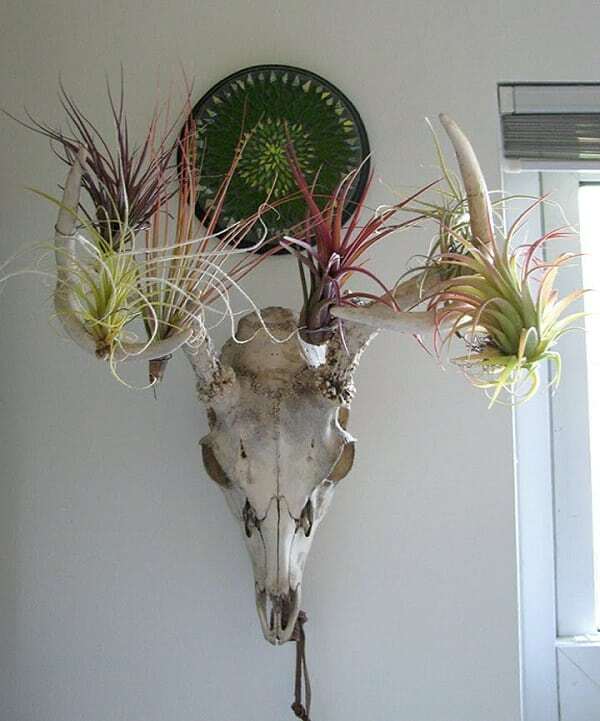 For that daring bold style, go ahead and utilize a skull; together with air plants, the unusual combo is interesting, especially for Halloween decorations! 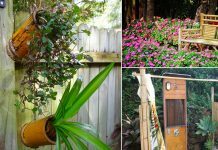 A smart re-purposed or up-cycled piece can make all the difference. We found the idea here! For a warm decor, go for mugs and cups; plus consider other unique items you’ve in your home! People who love the elegance of leather can put it into decorative use; consider leather holders. See the step by step DIY here! 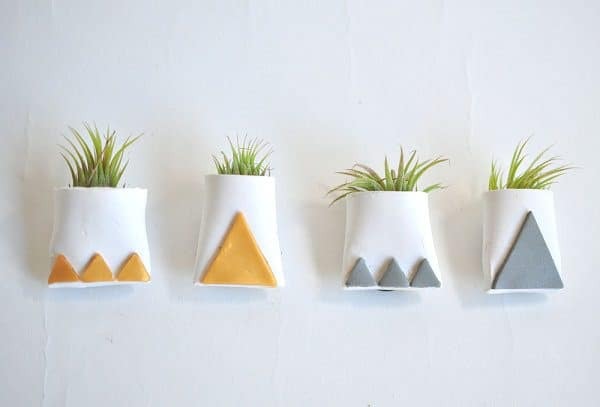 Geometric motifs with metallic details can transform walls and with a display of several air plants, they become alluring. 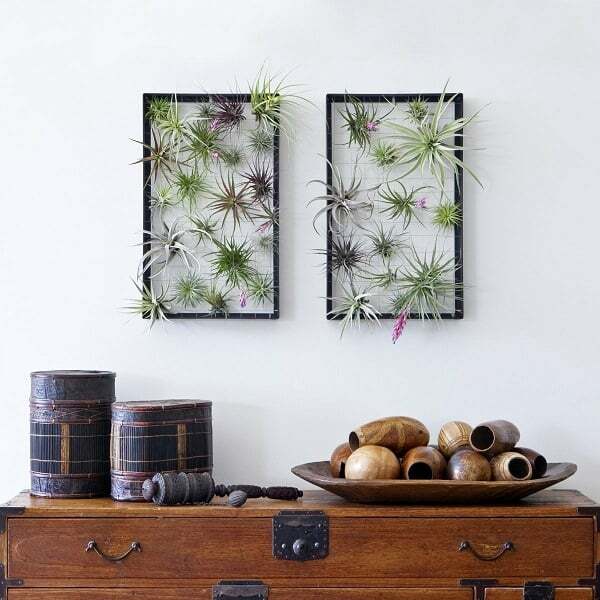 Dedicate a full wall to display air plants and see how different it’ll look. 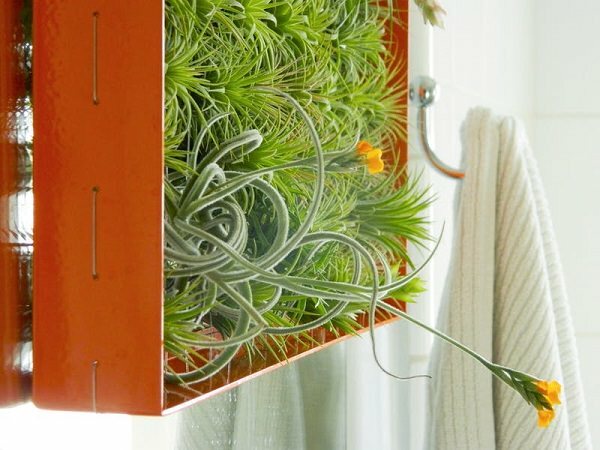 Suitable wall hooks can be used to hang the plants. 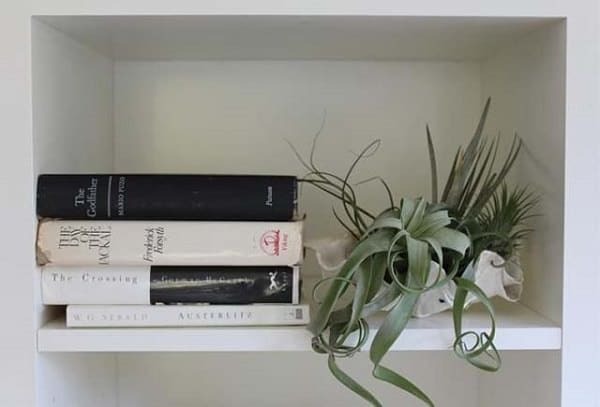 You might want to shelve your clam-shell air plants together with your books; do this tastefully as shown. 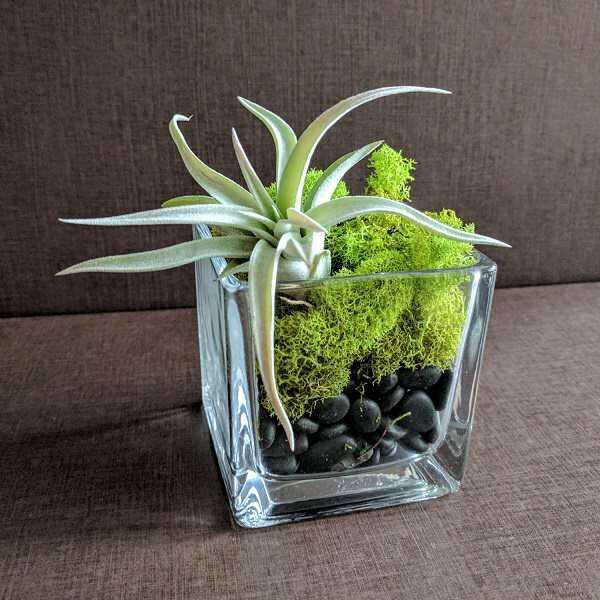 Add air plants, moss, and other plant materials for a low-maintenance, all-natural tabletop centerpiece that you can display indoors or outdoors. The DIY idea is available here to follow! 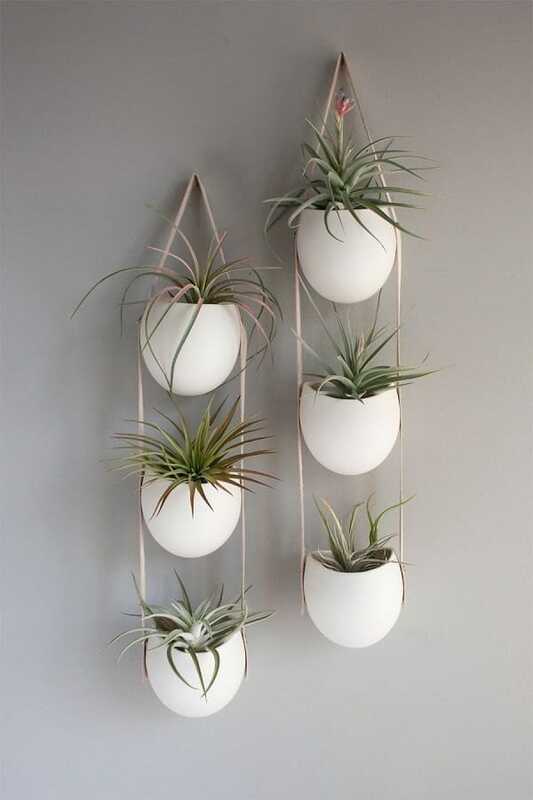 Use air plant frames to create a beautiful living wall of them. A DIY is available at Apartment Therapy! 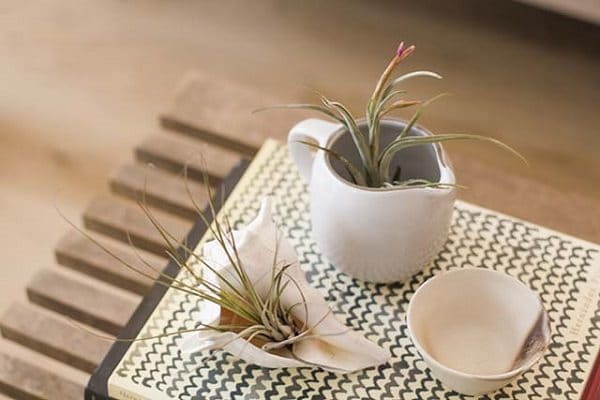 A smooth ceramic air plant holder can be used to add depth and elegance. 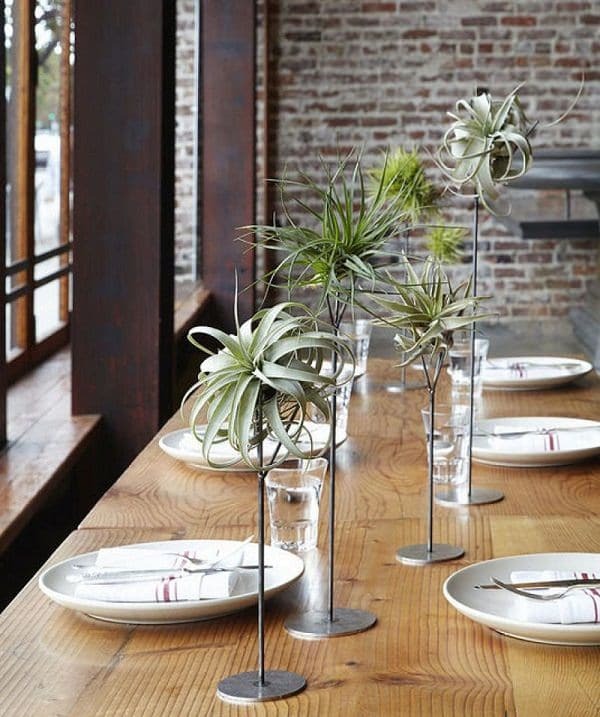 Air plants can be used together as a centerpiece and to bring out more life. 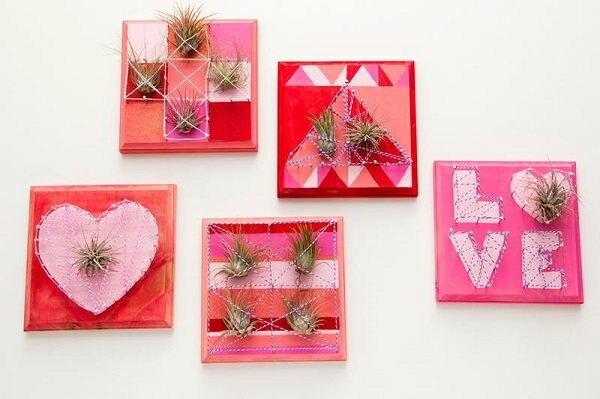 A theme around romance can be created to bring out a personal touch using the air plants. This can be ideal for special occasions and just for fun. The DIY tutorial is here! 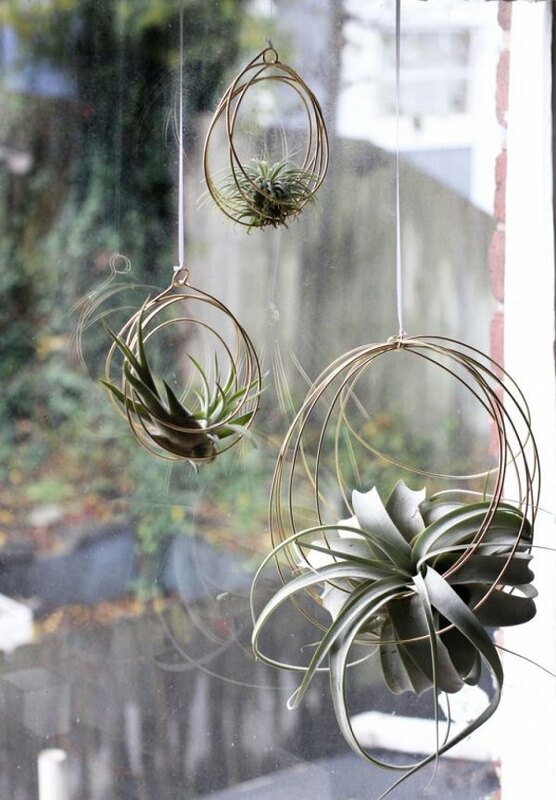 Using thread can take air plant hanging to a whole new level. 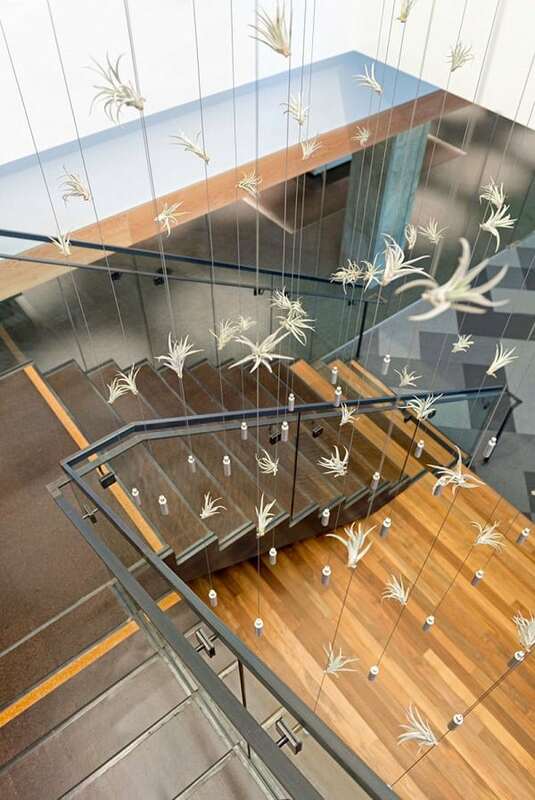 Hanging from the ceiling is not only creative but brings an artistic feel. We found the idea here! 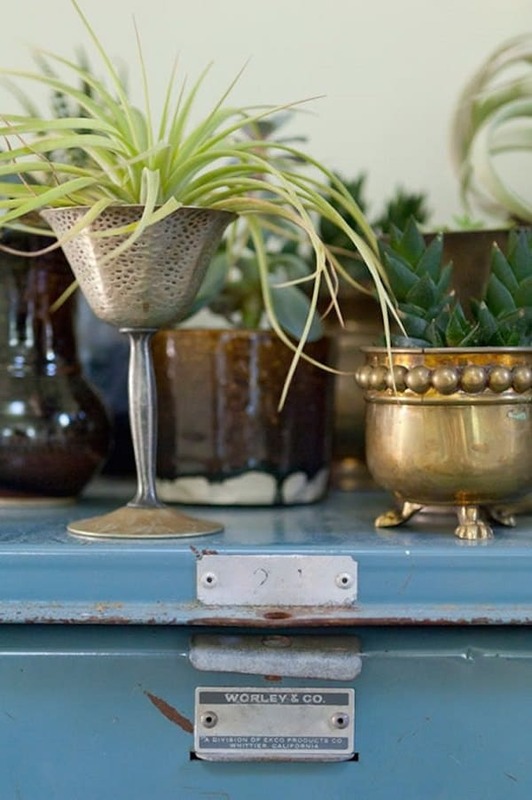 A vintage goblet to hold air plants is an incredible idea. You can experiment with what you’ve! 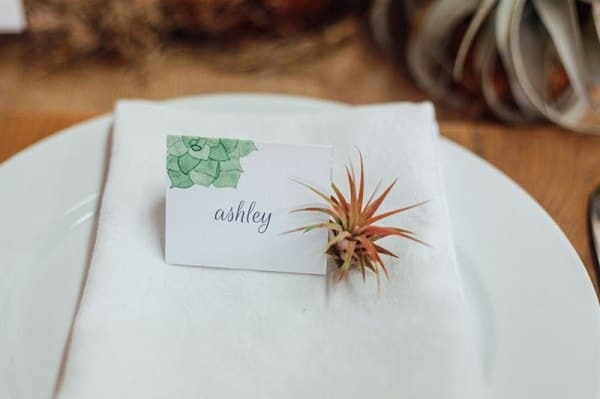 For a decorative personal touch, consider using air plants as place holders. Learn more here! 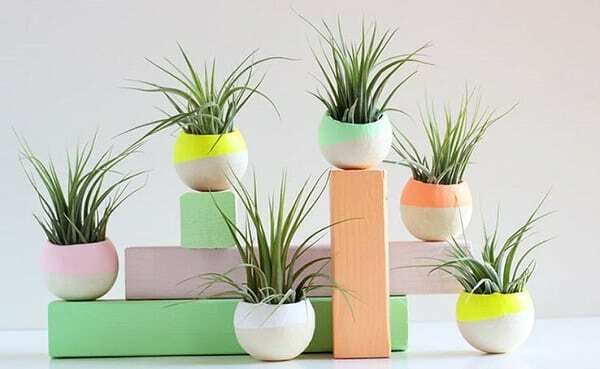 For that bright and invigorating look, neon planters are the way to go; play around with the colors for a great vibe. 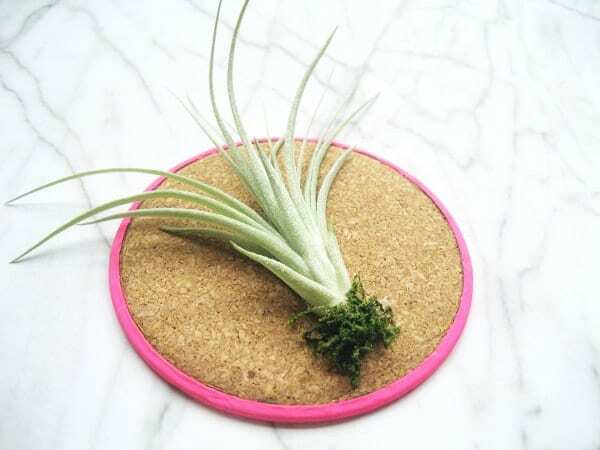 ‘Aeriums’ are great alternatives to terrariums; with no dirt involved. 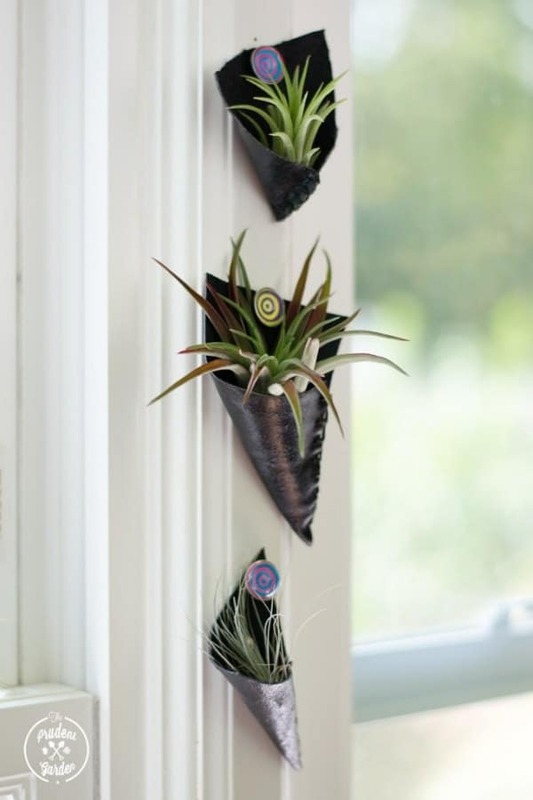 Consider displaying your air plants in this manner. The DIY is here! 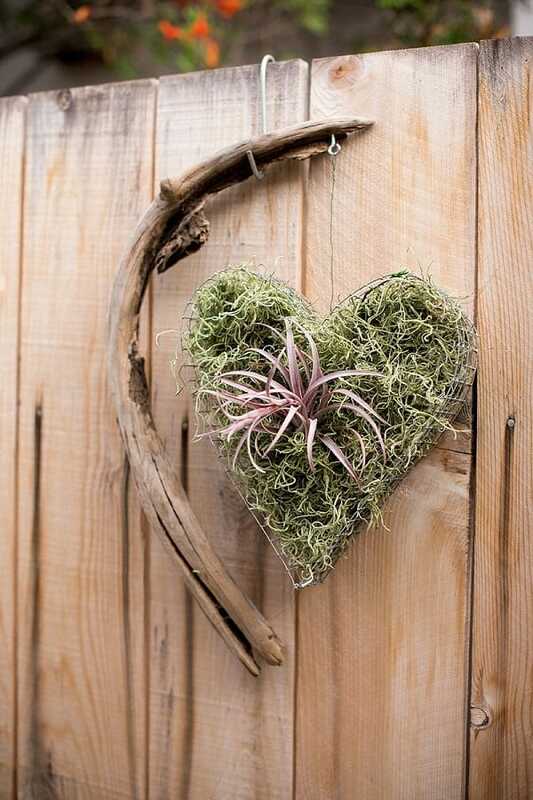 Driftwood, some wires and air plants can make a real rustic decor. Getting creative and having a theme will top the idea. 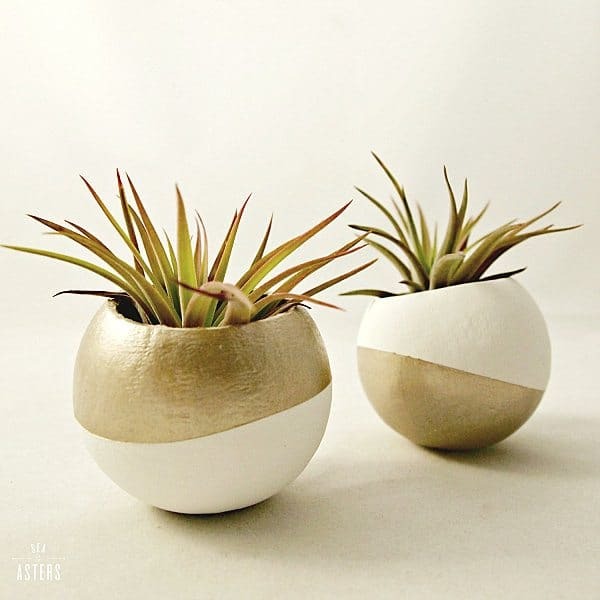 Go for more contemporary planters which can utilize colors in a blend that is artistic. Aqua and gold particularly work well to bring that modern feel. 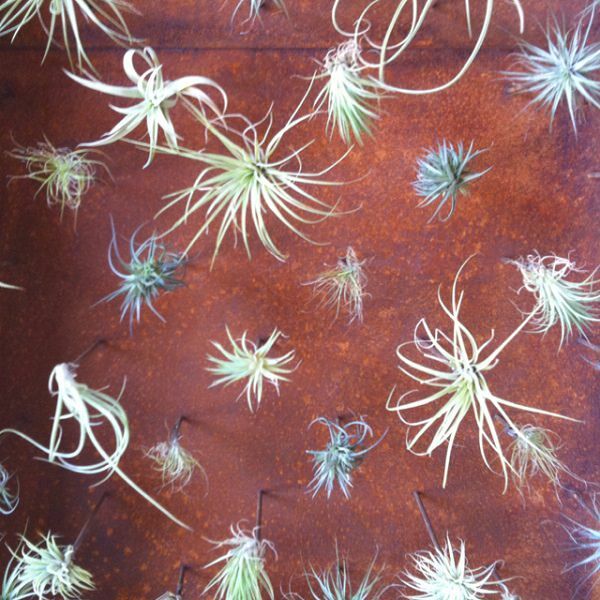 Create an air plant like you create a succulent wall to display epiphytes. We found this idea here! 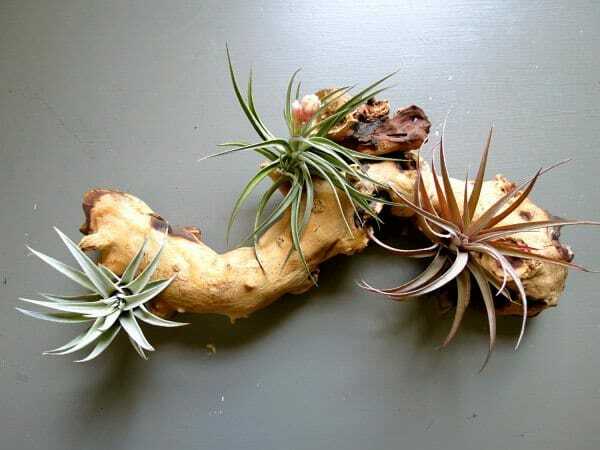 Little log rounds mounted on a wall bring out a unique tone; this works great for smaller air plants. Bigger logs can be used to accommodate bigger plants. Bottom of a wine bottle, which was cut at about 2 inches high and sanded. 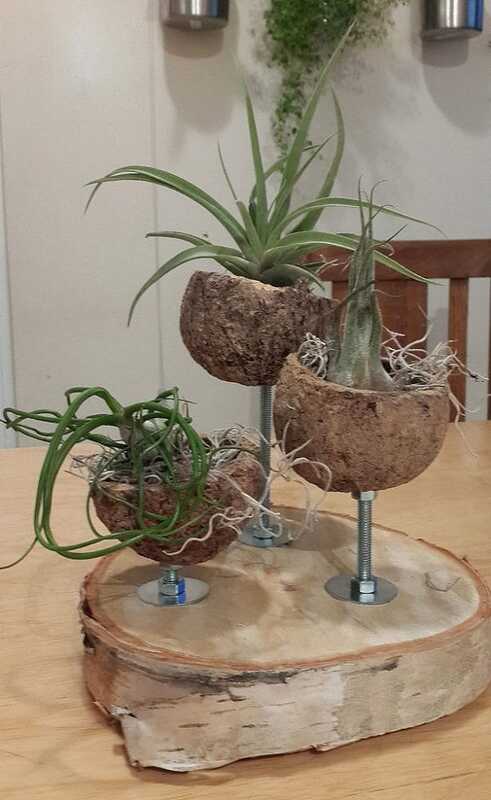 Three air plants (Bulbosa, Ionantha Van Hyn, and a Filifolia) are placed in it! 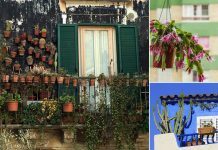 Next article17 Hanging Herb Garden Ideas For Small Spaces!